Quality professional optical dispensing requires years of training. After completion of two years as an apprentice and much coursework, opticians are given the opportunity to test for the State Board Examination. Only the best trained and most qualified opticians achieve State Licensure. The quality of your finished eyewear is dependent on the proper selection of frame size and shape, the careful measurement of optical centers and multifocal position, and the proper adjustment of the frame for both comfort, appearance and optical performance. Morrow Vision Center is proud to be one of the few practices in Ohio to employ two licensed opticians to take care of your eyewear needs. BECKY came on board in May of 1997. Born and raised in Morrow County, Becky graduated from Mt Gilead High School in 1986. She lives with her husband Dan and daughter Caitlin in Mt Gilead. Becky enjoys entertaining friends and family in her newly landscaped back yard, or just relax with a good book! She loves to shop and have dinner at her favorite Italian restaurant. 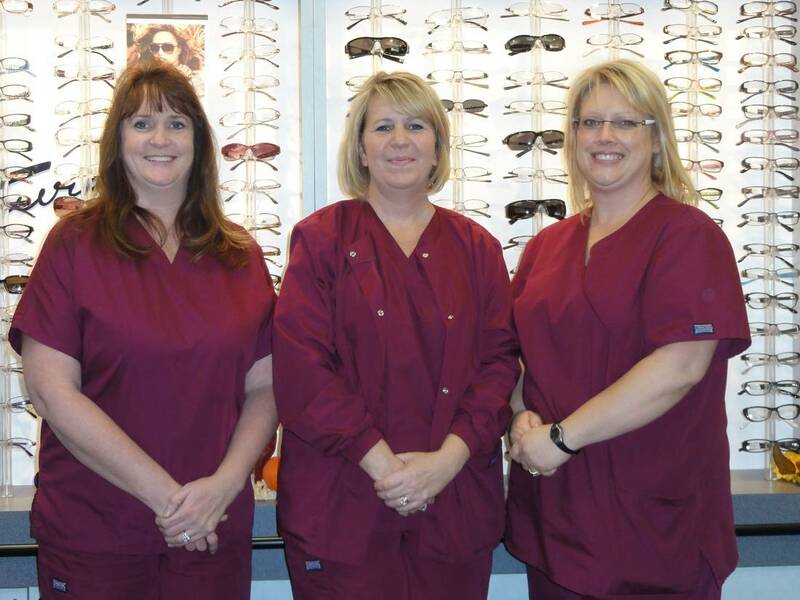 Before becoming our front office manager, Becky worked as a paraoptometric in our office and completed the American Optometric Association course in Optometric Assisting. She performed the preliminary testing for patient exams until she began her optician apprenticeship in 2004. She then began the coursework and study needed to pass the state licensure exam in November of 2006. Upon passing the exam, Becky acquired her Ohio license with the Ohio Optical Dispensers Board and her national certification with the American Board of Opticianry. She is also a member of the Opticians Association of Ohio. MICHELE graduated with honors from Madison High School in Mansfield in 1983. She attended Ohio State University in Mansfield and transferred to Akron University. Michele graduated from Akron University in 1988 with a Bachelor of Science degree in Biology. She worked in the medical field in Columbus until she moved to the Mt Gilead area in 1991 to raise her three children, Kate, Jordan and Matt. In October 2011, Michele married Brian and added four more children to her family! Between keeping up with school activities and sporting events, Michele is also involved in church activities. She finds time to include her favorite hobby of crafting exquisite porcelain dolls, dressing them in hand stitched clothing and accessories. Upon joining the practice in February of 2003 Michele trained and certified as a Paraoptometric performing preliminary testing. After completing the required coursework and apprenticeship also passed her Ohio Licensure Exam to obtain her Ohio Optician’s License in May of 2006. Michele is also certified nationally through the American Board of Opticianry and is a member of the Opticians Association of Ohio. KIM joined Morrow Vision Center in 2012. She has an extensive background in the healthcare and pharmacy fields. Kim is in the process of training as an optician. She is a huge fan of animals and the Minions from the Despicable Me movies. She and her husband, Kevin are raising their two children, Zach and Hollie. Kim and her family enjoy vacationing at Topsail Island, NC.